Convenient location and excellent service. Recommended by a friend. Dropped my car off for an emissions inspection in the morning. Picked it upon my way home. Not only did they wash it, they even vacuumed the carpet! Oil and filter change today - the LTD team rocks. Thanks for all you do! Great service, convenient location. LTDAC is the best. fast and friendly service. fair prices and clean comfortable waiting area. Did are great job working with me. Explained all my issues and they gave a quick written response with an estimate to correct the problems prior to performing the work. No surprises, which is always great opposed to other auto mechanics dropping additional costs on repairs unbeknownst until time to pick up vehicle and having to pay what was not expected. Living the Dream didn't do that. That is why they get "Five" stars. Also, car was cleaned to my surprise. I was referred to Living the Dream by family members who had been going there since they opened. I had a horrible experience with Mastria Nissan in Raynham where I was told I had an issue with my engine harness wires and the whole harness would need to be replaced for $3100. The exact recommendation was that "There are so many wires in the engine harness that it would be impossible to find the issue. It can't be fixed without purchasing a new harness." My choices were to either pay to fix it or to trade in the car which was purchased brand new and owned for just over two years. I brought it into Living the Dream providing the estimate the dealership gave me and explaining that I had my car in the shop off and on for over 2 months at that point. I dropped the car off at 11am in the middle of the week and they called me back 3 hours later telling me they had found the problem in the engine harness, fixed it, and I had my car back by the end of the day completely fixed for about $500. This issue was resolved and saved me from purchasing a new car and several thousand dollars to fix it. I've had positive experiences with Living the Dream since then. 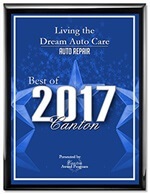 They will go the extra mile and put in the work to properly diagnose and repair your vehicle. They are honest and go out of their way to accommodate your schedule and transportation needs. I am very appreciative of the staff there, have referred others already, and continue to go back to them. I've been a customer of Paul's at Living the Dream for almost as long as he's been in business. I trust him100% when he says that my vehicle or my wife's vehicle needs to have something done. He is honest, reliable, caring and professional. His prices are more than fair and he stands behind his work. What more could you want? Highly recommended!! Always a great experience. My Prius works like a dream - 90,000 miles and counting!!! Why - LTDAC!!! !